This Sunday I volunteered at the Quick Check Balloon Festival. 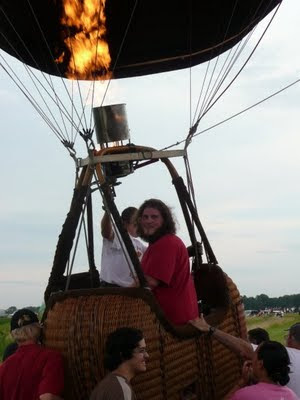 The reason I was able to volunteer is that a friends brother is very well known in the ballooning world and asked for some college student volunteers. So I was there all day Sunday and my parents came in the morning and where able to help. This is a nice shot from Sproulville (where we where based). An interesting thing about the "Funnies" is that on the inside they are shaped just like all the other balloons and then there is additional material and cables to give it the shape. This can be seen in the flag balloon where you can see the outline of the internal balloon. These are the Pirate Barrel and Barn balloons (note the Pirate Barrel as it will come up again latter). This is the really cool Vader balloon. The people who made it asked Lucas for permission and he gave it under the condition that it was done exactly like Vader (It weighs in at 640 pounds with an internal volume of 106000 cubic feet). The Giant Panda balloon. My friends, parents and I helped deflate and pack up this balloon, the people who owned it where incredibly nice and even gave us all pins of the panda balloon next to another balloon (The balloon weighs in at 611 pound and has a 112000 cubic foot volume). I just really like this shot (The little girl with the camera was with the balloon, and my mother is in the background). Here is Jimmy, my mother, pasha and myself helping with the deflating of the Giant Panda, me and my mother are holding open a Velcro vent designed to help get the air out faster when packing it up. Part of Sproulville was this 100 ft extending entenna that we where tacking down here. The Sprouls normaly use it for Ham radio but this this case they had it up 25 ft (normaly they would do 50 ft) and had a wind sock and weather station at the top (the sock is off but the weather station is to the left of the antenna). The festival was on an airfield hence the airplanes, the clouds on the other hand where part of a crazy storm that hit around 5:00 in the afternoon and lasted about 5 to 10 minutes. There was some incredible lightning and a tornado touched down about 10 miles from where we where. The clouds could be seen twisting around and spinning, it was very cool. Then the wind hit and hit it did. There was 80 mile an hour winds that caused 8 injures at the fair (although I dont know how serious they where). Another photo of the clouds, they really where writhing about. This is how a baloon is inflated. 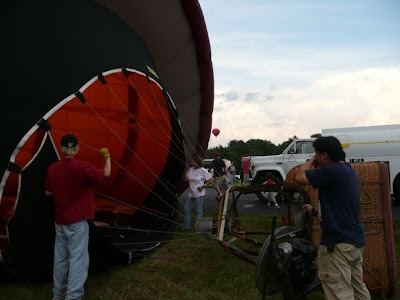 After the ballon is layed out and all the vents are shut a fan is used to cold inflate the balloon. My friend Max is manning the fan, and jim is helping hold the throat open. Then of course comes the addition of flame. I was told that the burners where running at 25 million BTU. This is a shot of the inside of the Pirate Barrel ballon while the burner is on. You may wonder how I got this shot, well just look a little farther down. Yep I was in the balloon, although we didn't fly far. We only went up a couple feet as can be seen here, so that the ballon could be moved to a better place to deflate it. 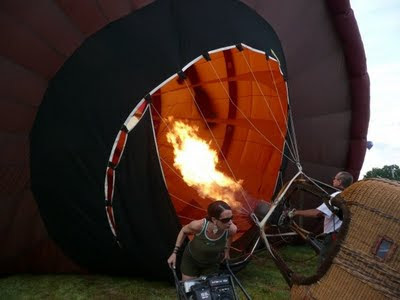 Just as a note, the ballon is controled with the burner and with a large vent at the top. The vent is a large circle cut out of the top, that is secured at a number of point on the crown of the balloon. A rope connects this to the basket, where pulling on it opens the vent, the more you pull the more open it gets. Balloon in mid deflate. You can see me and other keeping the balloon off the wet grass, we where attempting to pack it dry and I believe we succeeded. However, there where times when the ballon had be completly covered, it was over my head and on both sides. It took some time for me relize that I was only about 8 feet from my friend jimmy. Finally the ballon has all the air still left forced out, it then gets folded into the center as can be seen in the left of this picture. After the balloon is completly deflated and looks like a long snake everyone grabs it at about 5 foot increments and then feed the balloon into its bag. At this point I would like to point out that I believe this is the post now has the record for the most photos in a Lansey Brothers Blog post. Those clouds are amazing! I heard about the tornado watch.